Seasonal produce from Snow's Bend Farm is available to the public through our Community Supported Agriculture program, serving Tuscaloosa and the greater Birmingham area. You can also enjoy our produce, flowers, and other organic fare at many local farmers' markets and fine restaurants. Community Supported Agriculture is a special producer-consumer relationship in which the consumer invests in a farm's harvest at the beginning of the season. For farmers, this ensures a market for their product and cash flow at the time when it is most needed. 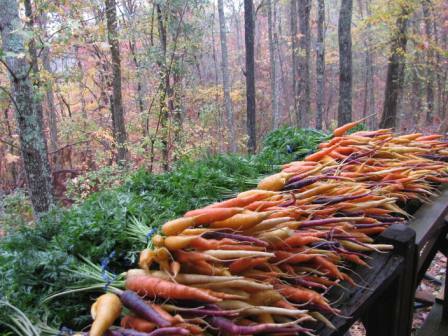 In exchange, our farm guarantees the highest quality produce of the season delivered every week. Our produce is available for pick-up at your choice of locations. We also offer home delivery within a reasonable radius and for a fee. You will also be subscribed to our "News from the Bend" blog, receiving posts that describe the week's allotment, how best to preserve and prepare the harvest, farm happenings, and recipes. And each fall we invite members out for our annual Fall Harvest Party. This is a wonderful time to enjoy the unique beauty of our farm. just right for two. We choose crop varieties based on flavor. In addition to traditional favorites, we grow specialty, heirloom, gourmet, and ethnic varieties. This year we are growing 46 vegetables, representing 225 varieties and herbs, as well as many cut flowers. Spring distributions include a variety of salad greens, head lettuce, cooking greens (turnip, mustard, kale, chard, broccoli raab), peas, onions, roots (beets, carrots, radishes, turnips), strawberries, fava/broad beans, Brassicas (broccoli, cabbage, cauliflower, kohlrabi), fennel, and herbs. Summer includes tomatoes, peppers, eggplant, squash, peas, beans, cucumbers, melons, okra, potatoes, garlic, and basil. Fall includes many carryovers from summer as well as rutabaga, leeks, winter squash (pumpkins, butternut, spaghetti, delicata), and sweet potatoes.